Good time on this Japan tour. Sights were excellent. Had a good time going on this Japan tour. The sights and tour guide were both excellent. We were able to cover a lot of Japan during this tour. The accommodations were okay. 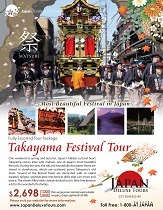 Wanted to spend more time in Takayama during this tour. Takayama was beautiful. My only complaint is not enough ramen to eat. Le Daiba is hard to reach from interest areas like Shinjuku, especially only one train stops at midnight. Grand Prince Kyoto closes restaurant too early! More Ramen! Bring bento box on bus! Tour guide should give much more info on timing, what to wear, what to expect. Takayama was poor planning. Should skip Thatch village to get to Takayama earlier. Also give better instruction on seeing the procession. Dinner was planned wrong time. Joke was average. Give more info on schedule!